In a small skillet over medium heat, melt the margarine and stir in the bread crumbs. Stir until toasted. Set aside. Bring a large pot of salted water to a boil. 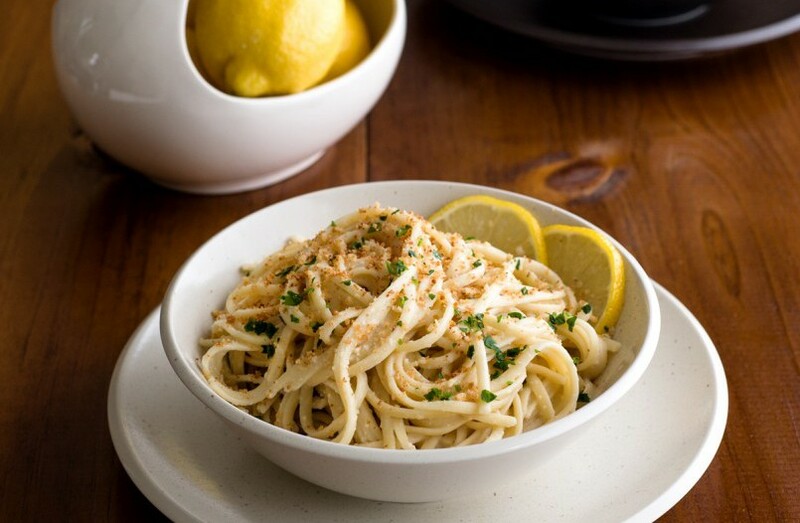 In a bowl, with a fork, blend the egg replacer with the soy milk, faux Parmesan, lemon zest and juice, salt, and pepper. Taste the sauce and if you want it more lemony, add more juice. Cook the pasta according to the package directions. When the pasta is just al dente, remove it from the heat. Reserve about 1 cup of the cooking liquid, drain the pasta, and return it to the pot. Toss in the remaining 4 tablespoons of margarine (for a lower-fat dish, use only 2 tablespoons to toss) and stir and swirl until all the pasta is coated. Stir in the egg replacer/parmesan/soy milk/lemon mixture and turn the pasta in it, adding a few tablespoons of the cooking liquid if it looks a bit dry. Place in serving bowls and sprinkle with parsley and the buttered bread crumbs. From the book The Cheesy Vegan by John Schlimm. Excerpted by arrangement with Da Capo Lifelong, a member of the Perseus Books Group. Copyright (c) 2013. www.dacapopresscookbooks.com.